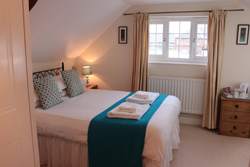 The Cottage offers four well-appointed and luxurious en suite bedrooms. 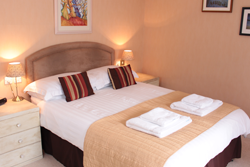 All rooms have flatscreen Freeview televisions, complimentary tea and coffee making facilities, hairdryers and en suites with big fluffy towels and luxurious toiletries. All bedrooms can accommodate a travel cot, which can be provided. Double/Twin/Family room with en suite shower. The room contains a double bed and a single bed. A further bed can be added to accommodate a family or group of 4. Double/Twin/Family room with en suite bath and shower. The room contains two single beds that can be joined to make a superking-size bed and also offers a spacious seating area. A further bed can be added to accommodate a family or group of 3. 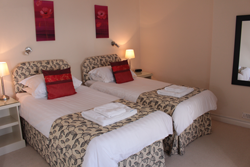 £75 per night for a double or twin room, based on 2 guests sharing. From £50 for single occupancy. 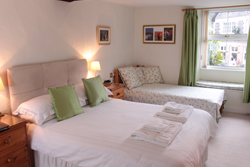 For a family room, £75 per night (for the first 2 guests) plus £37.50 per adult, £20 per child aged 4-15. Children aged three and under stay for free. At the time of booking, we request a deposit per room which is refundable if the booking is cancelled with at least 7 days notice. For all cancellations, an administration charge of £5 will be applied. Check-in is from 4pm or earlier by prior arrangement. Our latest check-out time is 10.30am but a later check-out time is possible by prior arrangement.